Lovers of the great outdoors will find themselves very much at home in the Forster- Tuncurry and Pacific Palms region. The destination, now part of the Barrington Coast, is known for its white sand beaches, endless turquoise waters and ancient forests. Coastbeat chatted to some long-time locals who shared their suggestions on making the most of this unique wonderland. 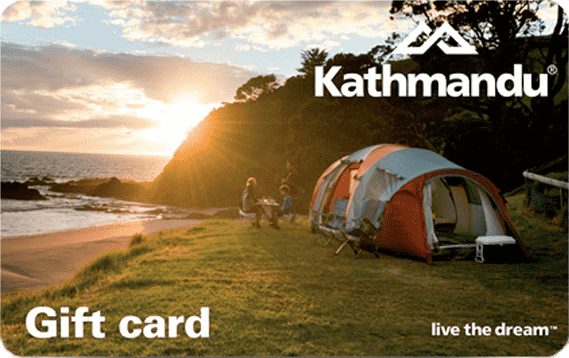 So, pack your adventure gear and settle in for a weekend (or better still – a week) of reconnecting with nature. Outdoor enthusiasts are truly spoiled for choice in the Great Lakes region – named for the three adjoining lakes that create snake-like waterways, providing endless opportunities for exploration. Wallis Lake is hard to beat when it comes to nature on show, with plenty of locals (and their pooches) spending their weekends SUPing on its calm waters. Kids can also play in the wide expanse of safe, shallow water – great for parents who want to relax! 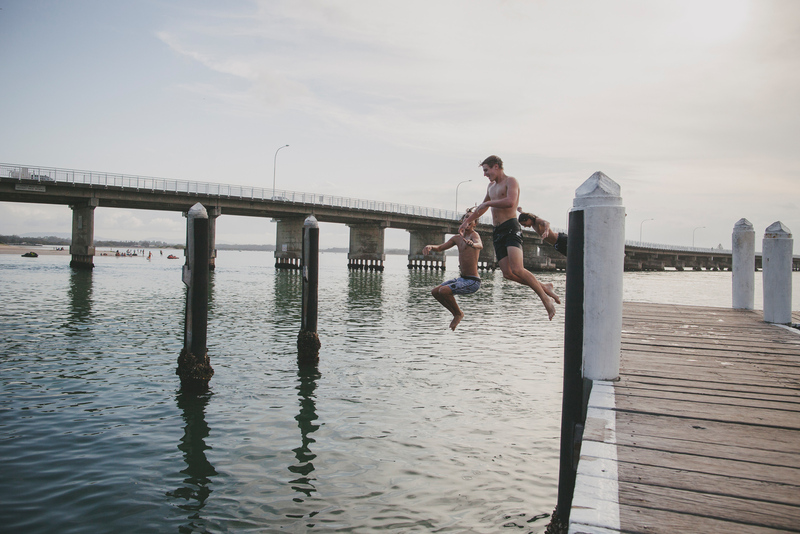 Wallis Lake also consists of many islands, shoals and bays; one local family said they love to swim or paddle to the islands near the Forster-Tuncurry Bridge at low-tide to spend the day playing in the shallows and exploring. If your kids are a little more energetic, visit One Mile Beach, where they can burn some energy bodyboarding down the steep sand dunes. At Booti Booti National Park you’ll find one of Coastbeat’s favourite walking trails (featured in our Autumn 2018 issue), a loop of several kms which begins at the Ruins Campground. The walk takes you up the northern side of Booti Hill, along the ridge and then down to Elizabeth Beach. It’s a gorgeous trail, with the ocean on your left and bushland to your right. Booti Booti National Park is also home to over 200 bird species so twitchers best pack the binos for this outing. Just along from the Ruins Campground you’ll find The Green Cathedral. It’s a unique outdoor cathedral and wedding venue under a canopy of green with Wallis Lake views. If there’s no wedding party in sight, it’s the perfect place to soak up the serenity. Boasting pristine beaches just begging to be explored and a tiny cluster of fibro beach shacks, Seal Rocks has managed to retain its village feel. Boat Beach is still a working bay so grab a sandy spot and watch the fishermen returning with their catch. 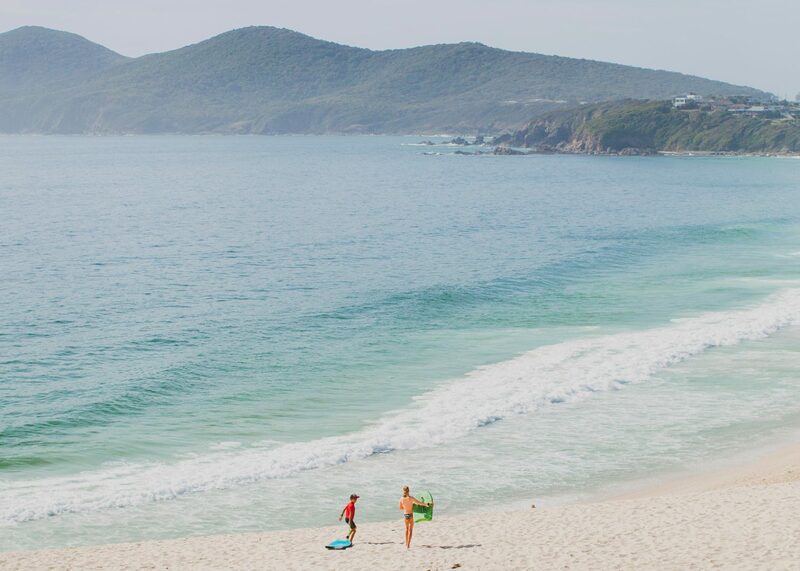 This tucked away little paradise is about 40 minutes south of Forster. 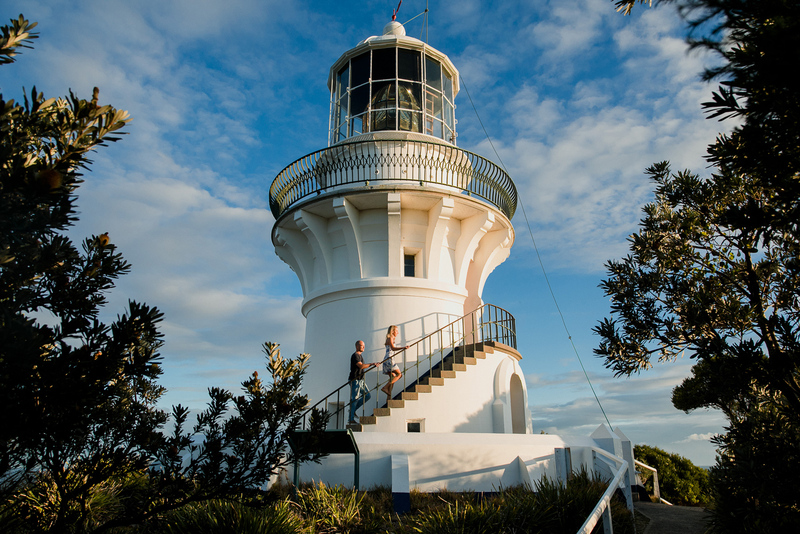 The Sugarloaf Point / Seal Rocks Lighthouse walk is another one to consider. It’s short (about 700m) and steep but all huffing and puffing is rewarded by the spectacular views from the top. If you really like the lighthouse, you can even sleep there, with accommodation available in the three keepers’ cottages. Surfers have waves a-plenty to choose from and locals say you can’t go too wrong from Tuncurry Beach all the way to Boomerang Beach. Janie’s Corner, accessed from Seven Mile Beach, also rates a special mention. Fishing enthusiasts will love Elizabeth Beach and Smiths Lake. There are plenty of outdoor activities to keep you busy in the Forster / Great Lakes region. Another recommended activity is a whale watching tour with Amaroo Cruises. The season runs from early June to late November. Last year, one guest was overheard saying her humpback whale trip in Forster was better than the Antarctic experience! Out of whale season, enjoy a top day out and plenty of dolphin sightings. Amaroo even offers a 100% dolphin guarantee! For those who want to get a little deeper, a dive trip with Forster Dive at Fisherman’s Wharf can have you up close and personal with the endangered grey nurse shark. Gabby from Forster Dive tells us that these sharks are placid, non-threatening and aggregate in the same spots in the ocean, so they’re a very reliable shark to dive with. After more bonding with marine creatures? Forster Dive also has a Swimming with Dolphins cruise which offers in-water dolphin interaction in the open ocean and lake environment. 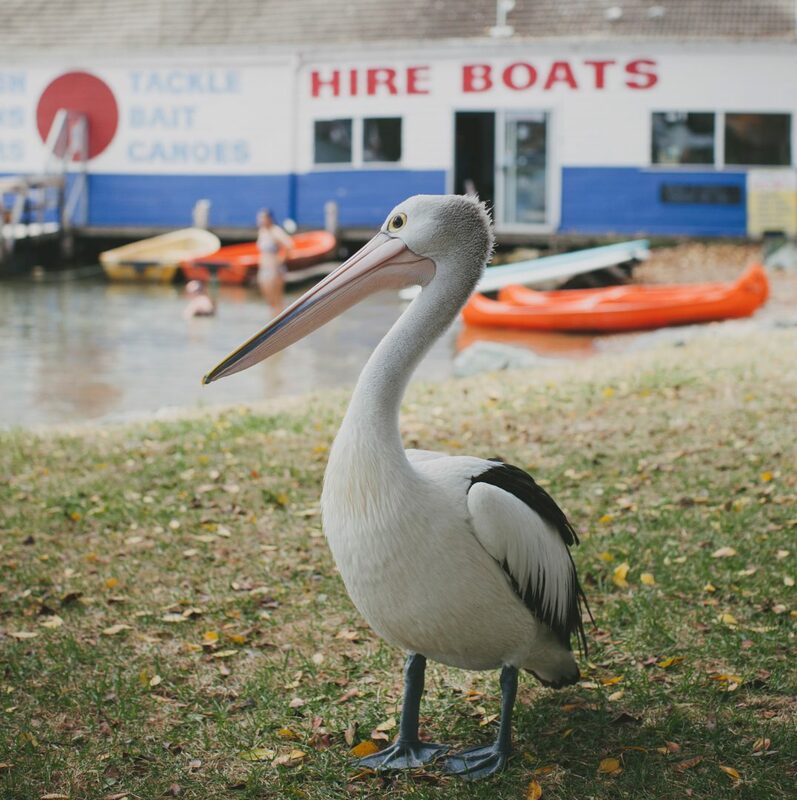 If you’re keen to while away in the waterways of Forster and its surrounds, why not rent a BBQ boat for a day or even better, a houseboat? Find out more at Forster Marina. No weekend away is complete without some local food recommendations. 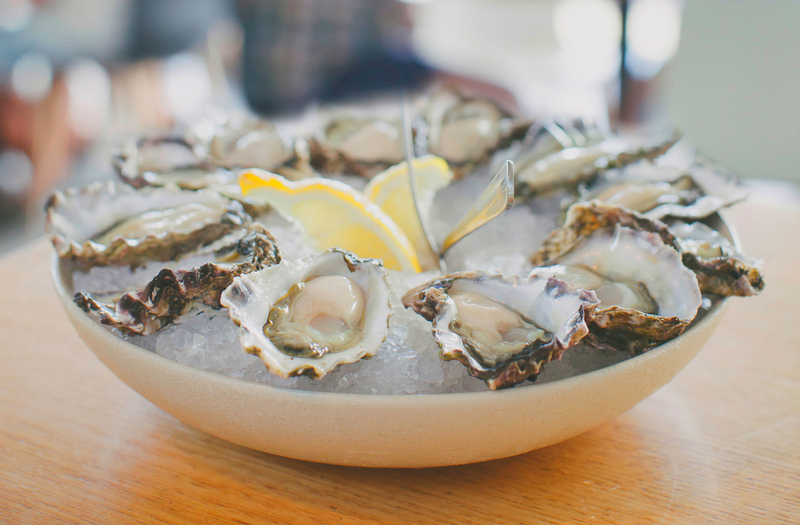 Sample the region’s famous seafood at Hamilton Oysters in Tuncurry where you can sit back and take in the wonderful waterfront position as you dine on something delightful. Dolphin sightings, fantastic cocktails and live music all make for a pretty unbeatable experience. The Reef Bar is another waterside pick. Their pizzas come highly recommended by those in the know. Next door to Reef Bar is the must-try Spice Monkey which specialises in Japanese fusion cuisine. If you’re after something a little more low-key but with yet another jaw-dropping view, finish your day with a meal and sundowner as you gaze across the lake at the Pacific Palms Recreations Club, better known as ‘The Recky’. Close by, at Blueys Beach you’ll find Kembali. At Kembali, the atmosphere is laid-back and welcoming, and the food is absolutely delicious. It’s a favourite with locals for its tasty Indonesian fare (menu hint: start with the Asian squid salad or Nasi Goreng). Word is the coffee’s great, too. While the Forster area is known for its famous turquoise coastline, the hinterland contains some hidden treasures of its own. No excursion into the hinterland is complete without a visit to the historic town of Wingham, where you’ll be faced with the tough decision between lunching at the deliciously healthy Garden Grub Café or coffee-lover’s favourite, Bent on Food. While you’re there, take a walk on the Wingham Brush Boardwalk to look for numerous rare birds and see hundreds of flying foxes sleeping in the treetops. The beautiful Moreton Bay fig trees provide a magical environment for the imagination to run wild. 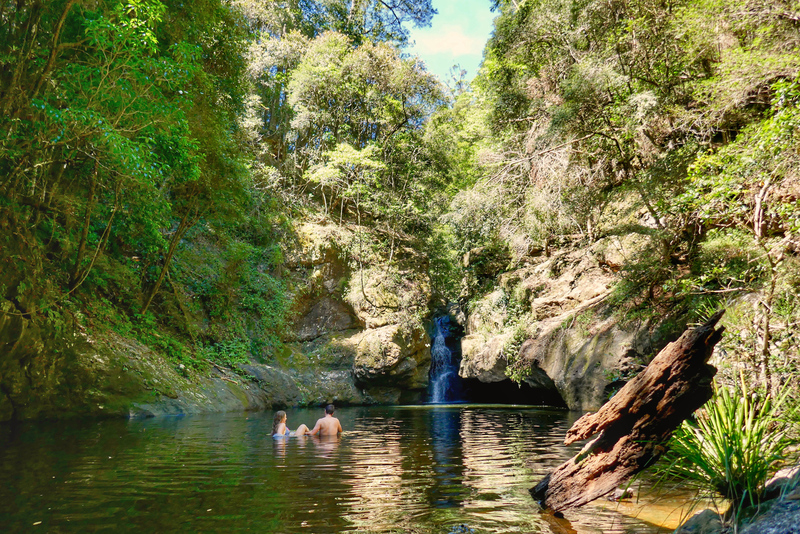 From Wingham, venture out to Potoroo Falls, where you’ll find a 900m walking trail leading to a fantastic swimming hole that kids will love. Potaroo Falls is also home to the largest recorded watergum in NSW. ‘Ancient’ – is the only word to describe Alum Mountain, which is located an hour’s drive from Forster. With its imposing rocky outcrops, lookouts, trails, a quarry tunnel from old mining days and picnic areas overlooking Bulahdelah and the Myall River Valley, this place is well worth a visit. For more information see www.greatlakes.org.au or call the Forster based Visitor Information Centre on Ph) 1800 802 692.